A few months ago, I wrote a post on SEOmoz about responsive web design, and how good it can be for SEO. 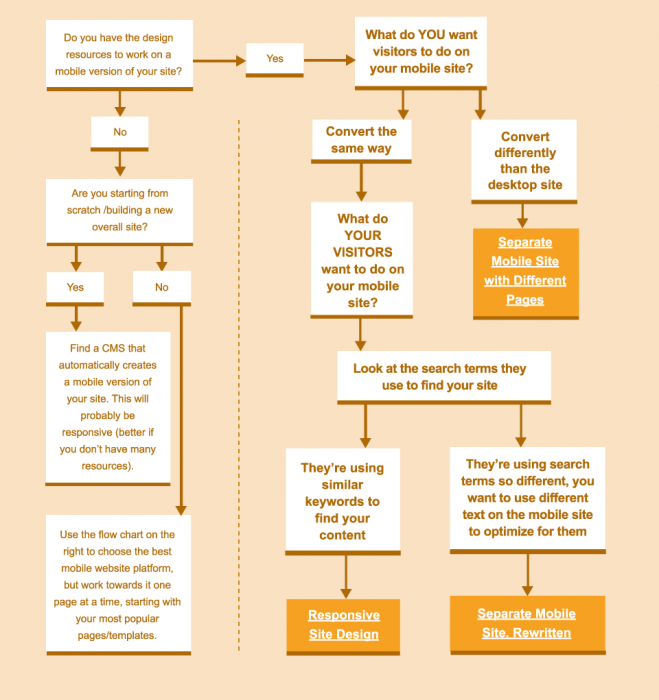 A fellow Distiller, Bridget Randolph, followed up with a post about how to optimize a separate mobile site. Both got a lot of attention: we're getting to the point now where having a well-optimized mobile site is becoming a necessity rather than an option. The question is, which format is right for YOUR site? To help you choose the best format for your site, Bridget and I decided to put together a best practice guide to Building Your Mobile Friendly Site, which we've just launched today. It discusses important points about design, development, search engine optimization, and web analytics for both separate and responsive sites. The first step, though, is choosing which type of site you're going to build. As I mentioned above, there are two standard options for your mobile site: responsive design or a separate site. A responsive site uses the same HTML for both the mobile version and the desktop version, but the CSS uses media queries to find the browser width and changes accordingly. A separate mobile site is just that - completely separate. If you don't have a lot of resources, find a content management system that automatically builds your site to be responsive. Just make sure to check the pages you upload with multiple browser widths - you don't know exactly what CSS rules they implemented! If you do have enough resources to build a new site, and you want your mobile visitors to have a different experience than desktop visitors, build a separate mobile site, with different pages and content. You'll probably want to include a link at the top to the desktop version of the site, though, and keep track of how many visitors choose to browse that site rather than your mobile version. You may be surprised at how many visitors want to see the same thing they see on their PCs. If you have enough resources and would like to deliver the same experience, the choice is down to how much you want to modify the mobile version of the site. If you would like to optimize your mobile site very specifically for mobile search, you should build a separate mobile site, since you can customize it separately. But first check to see if mobile searchers are significantly different than your PC searchers: if mobile searchers just have fewer long tail searches than desktop searchers, you really don't have to change keyword targeting. Which brings us to the last option: if you have the time and resources to build a separate mobile site, but want to deliver the same experience and content to visitors, build a responsive site! Since we don't have comments on the actual guide, let us know what you think in the comments below!